If there is a very special someone you will be missing on your wedding day, this vintage-style bouquet charm is the perfect way to honor his or her memory and presence in spirit on your wedding day. We also have this available in an antique cream color. --->This is designed for you to add the photo when it arrives to you. We recommend printing it .9 x .8 and trimming slightly to fit (about .8 x .7). 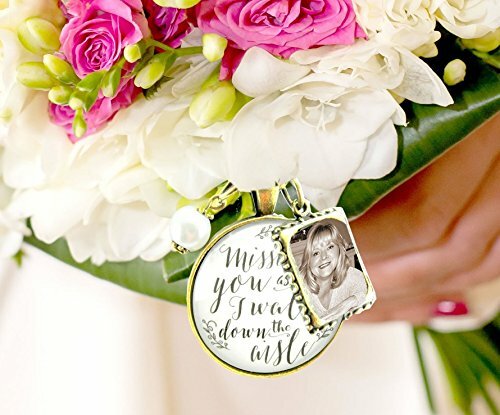 This glass pendant bridal bouquet memorial charm comes with a beautifully detailed zinc alloy bronze-colored frame charm where you can easily insert an image of someone special. It also has a glass white pearl bead. It comes on a bronze decorative lobster clasp with a 10" white ribbon. Give the charm to your wedding floral designer. "As I prepare for this special day I am reflecting on you and how I wish you were here to be a part of it. My loved ones gather to celebrate... but how precious it would be to see you standing nearby, giving me that look that communicates so much. Today is about celebrating love, and so it is natural that I think of you. I will carry you in my heart as I take those steps down the aisle, and I know that though you are missed, you are here in spirit."